"Abdu was a terrific CEO. 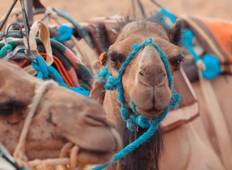 Even though weather was well outside norms, he made sure..."
"Very recommendable trip in Morocco. Itinerary very well designated. You'll get the..."
"I have been to Egypt 3 times and Momo (Mohamed Saiid), is the best tour guide I've..."
"We picked this tour for the fantastic itinerary that would allow us to see various..."
"very good, better than expected"
"This has been an exceptional trip made possible by members of our group,Yasser and..."
"This trip was amazing! 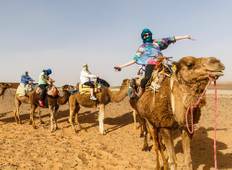 A hassle free way to get involved in seeing Morocco off the..."
"Samir was an excellent guide who went above and beyond, was available for questions..."
"The camel ride in the Sahara was the most exciting! Expect to have quite a lot of..."
"Our guide, Hamy Moustaffa, made all the difference: he was throughly professional,..."
"I had a wonderful time on my trip and Hicham was excellent, professional, knowledgeable,..."